Attorney General and Minster of Legal Affairs, Basil Williams, has denied ever threatening to kill a sitting Judge—Justice Franklin Holder—and has threatened to sue daily newspapers Guyana Times and Kaieteur News for ‘grievous libel,’ over the reports. Williams made the charges today (March 24, 2017) when he appeared for an impromptu press conference billed as urgent, in the National Communications Network (NCN) studio’s and broadcast live. Williams was at the time responding to the reportage in the two daily publications in their March 24, 2017 editions which stated that he threatened the sitting Judge who was then forced to leave the bench without ever formally adjourning the matter. He was speaking to the witness’ testimony regarding the receipt of a correspondence from the Office of the Prime Minister, Moses Nagamootoo and whether her answer had been recorded by the court. Williams in his explanation of what transpired said the banter at the time had reminded him of a similar incident—albeit over examinations—that occurred between himself and his classmate who was then a Magistrate that cited him for contempt some years ago—a Magistrate colleague who is now incidentally dead. The Attorney General told reporters in the NCN studio that said he was of the opinion that the Judge leaving the bench when he made an enquiry. According to Williams, the fact that a date had not been set for the next hearing is not out of the ordinary. The recently silked Senior Counsel, went on to explain that this formality is routinely done by clerks at a subsequent time by way of correspondence. He told reporters, at no time was the Judge threatened nor should he have felt threatened nor has he reported being threatened. Turning his attention to the media and its reportage over the courtroom incident that occurred yesterday (March 23, 2017), Williams said it was an attack on his office and by extension the government along with his character, which is being besmirched. The Attorney General said he is going to make good on his threats to pursue legal action against the media houses and that he would have been preparing a dossier over the years documenting false and spurious allegations for which the publications will be faced with having pay ‘Exemplary Damages’ for libel. “Did the newspaper approach the judge to get confirmation whether he was threatened or not,” Williams questioned, and reported that he has since not seen Justice Holder. However, late Friday Mr. Nandlall insisted that his account is factual. “His (Williams’) reckless utterances to Justice Holder was witnessed by at least two State Counsel of the AG’s Chambers, whom I have no doubt he will either force to remain silent, or lie for him, Carvil Duncan, Carvil Duncan’s Confidential Secretary, Diana Persaud, Rajendra Jaigobin, Attorney-at-Law, members of the press, two Marshalls of the High Court, my Personal Assistant Shivun Hutson, and a few persons who are unknown to me. These persons were all in the Court. Yet, Mr. Williams bare-facedly denies that he made the statements published by the press, which caused the Honourable Justice Holder to walk off the Bench in disgust and possibly fear, without adjourning the matter. In his characteristic style, Mr. Williams desperately tries to blame me for the morass in which he now finds himself and dishonestly accuses me of causing the Judge to walk off the Bench,” said Nandlall. The Attorney General also used the occasion to castigate his predecessor Anil Nandlall questioning whether he was under the influence of something given his incessant disruptions during the hours of court proceeding. 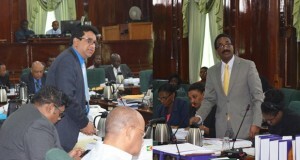 Lashing out at his predecessor, Nandlall who appeared as Counsel for Duncan, the Attorney General and Minister and Legal Affairs said he is in fact concerned that was allowed to dominate the court session for the entirety of the morning session of hearing.